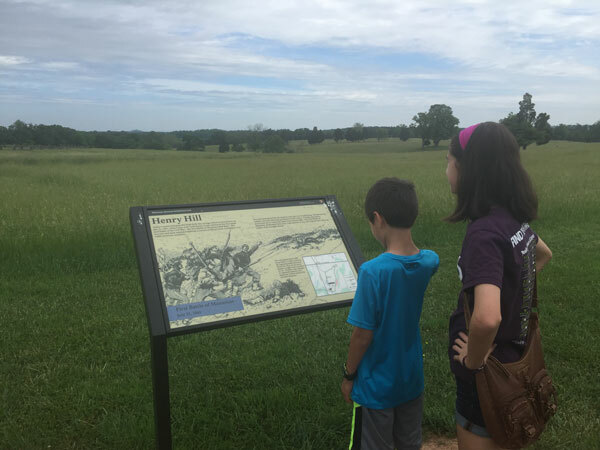 Last weekend was Memorial Day weekend and on Monday, the actual Memorial Day, my family visited the Manassas National Battlefield Park. 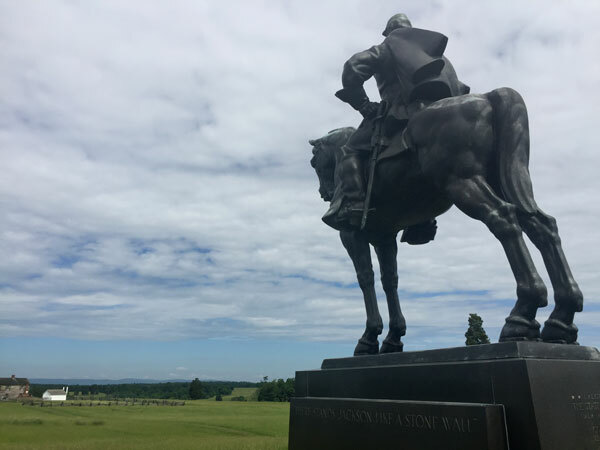 You may have heard the name Manassas but never really knew what the significance was. 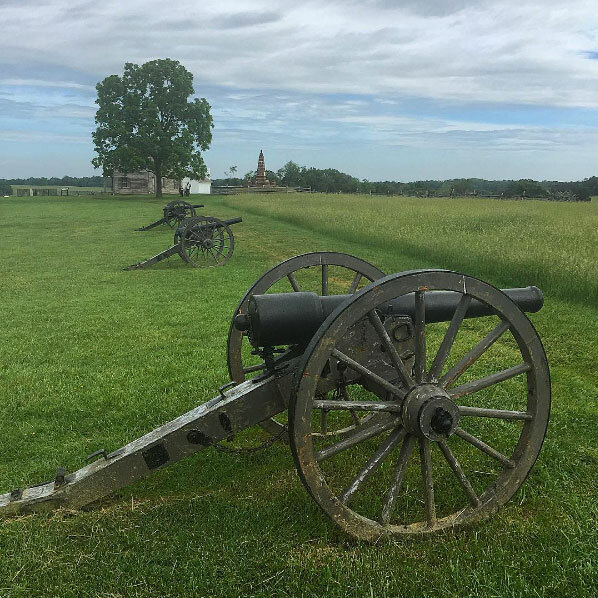 Manassas National Battlefield Park preserves the history and land surrounding not 1, but 2 battles from the Civil War. 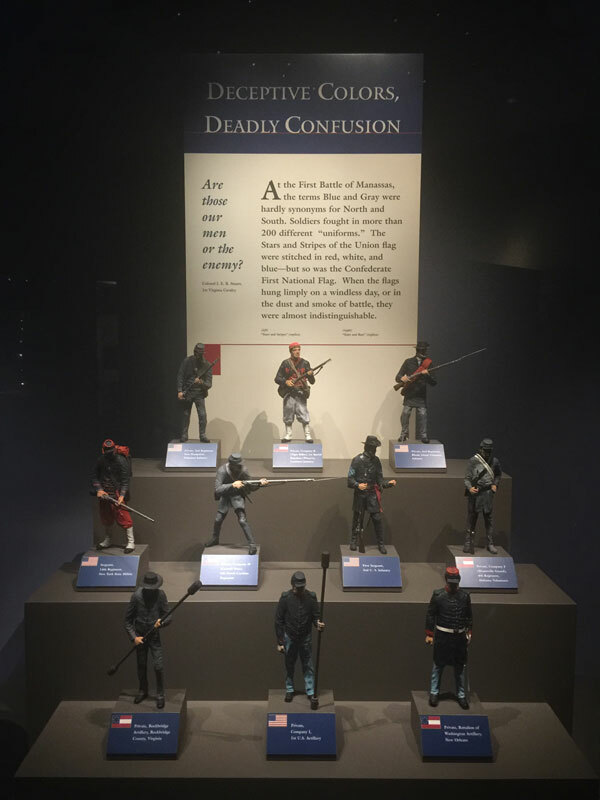 They are referred to as the First and Second Battles of Manassas but you may known them better as the Battles of Bull Run. 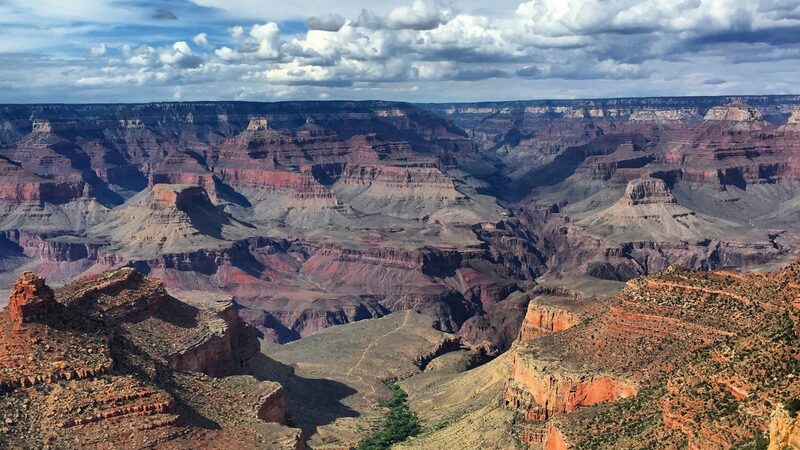 The National Park Service has many types of “units” in their system of 411 locations. There are National Parks like Shenandoah National Park, National Preserves like Big Cypress, and National Seashores like Canveral National Seashore. 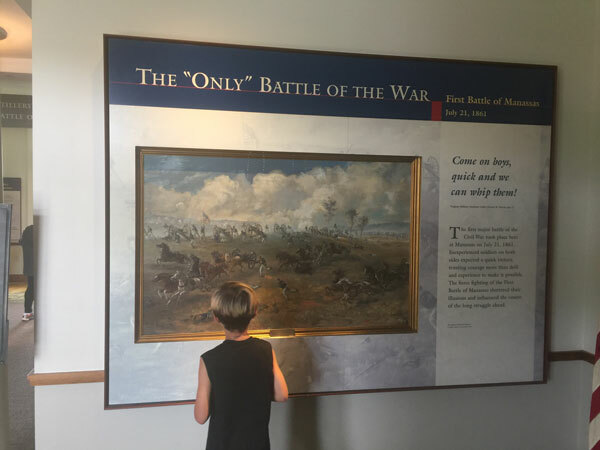 My family enjoys every type of National Park unit but because we live in North Carolina, we have access to a ton of National Battlefields: especially ones from the American Civil War! 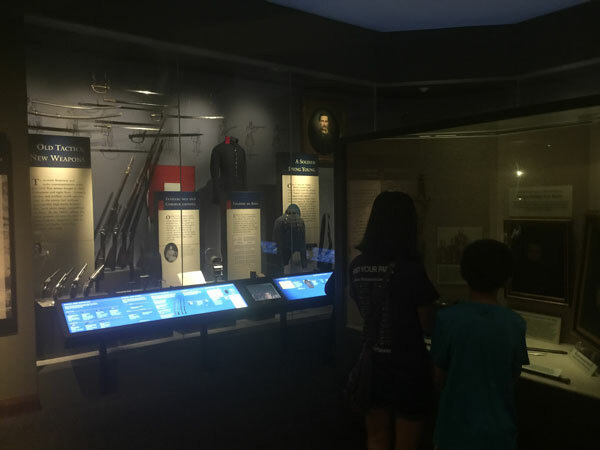 We have visited a number of significant Civil War locations like Fort Sumter, Appomattox Courthouse, Gettysburg, and Richmond. 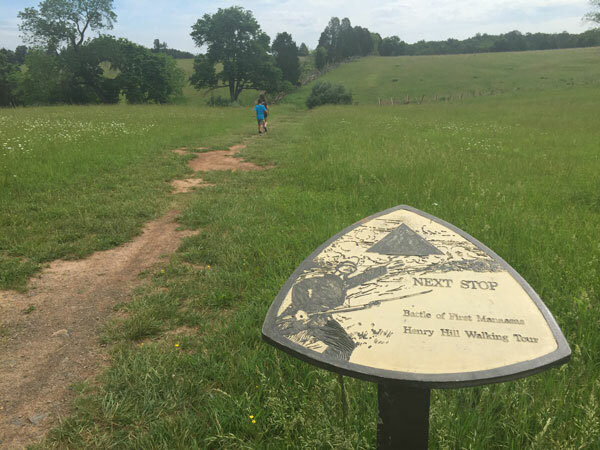 Earlier in the weekend we visited Antietam National Battlefield and Harpers Ferry National Historic Park. The battles of Bull Run was an interesting site to visit to continue to fill in the blanks of the American Civil War. We arrived early monday morning about 15 minutes after the Visitor Center opened and there was already a few rows of the parking lot filled up. By the time we left 2 hours later, every spot was filled and there were people parked on the grass! 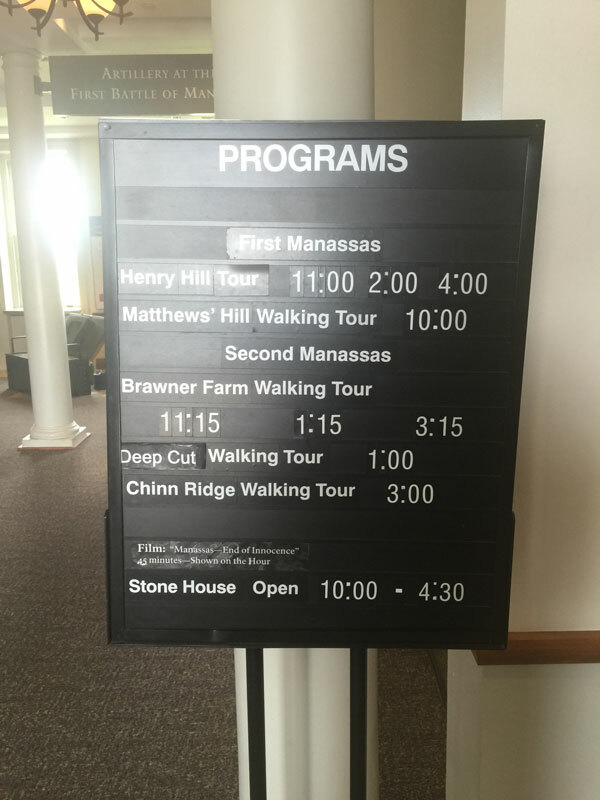 One of the best things about Manassas National Battlefield Park is their Ranger-led walking tours and self-guided paths. 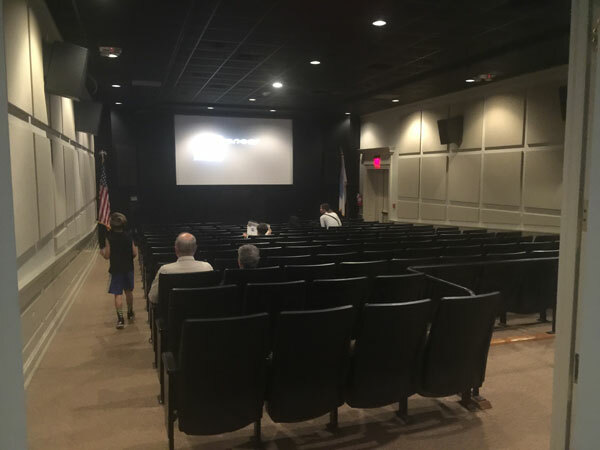 The theatre in the Visitor Center is air conditioned with ample seating and comfortable chairs. You need it because the movie is 45 minutes long! 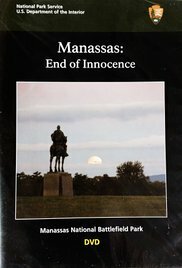 The movie is called Manassas: End of Innocence. This movie is really well produced with narration by Richard Dreyfus. It is super informative but because it covers 2 significant battles it is way too long at 45 minutes. Just the day before we saw the movie at Antietam National battlefield and it was a 26 minute long movie edited down from the full movie. This movie could have benefitted from an edit to give the basic storyline. The kids were excited to receive collector cards at the front desk from the Park Ranger. While a lot of these park units have them, we rarely remember to ask for them. 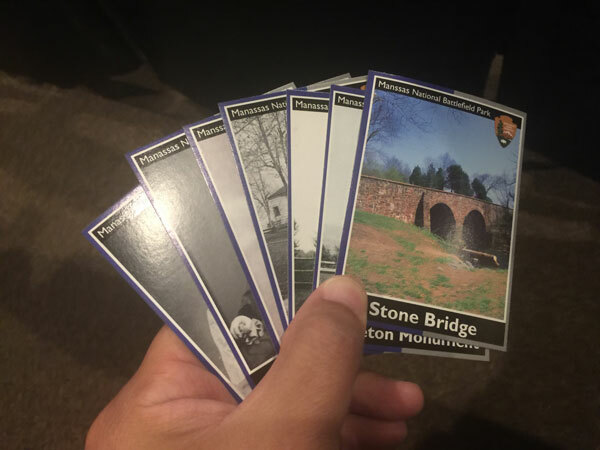 They are a great way for the kids to learn about different locations within the park. The Visitor Center also has a museum that has some pretty neat stuff in it. Here are some weapons from the battle on display. 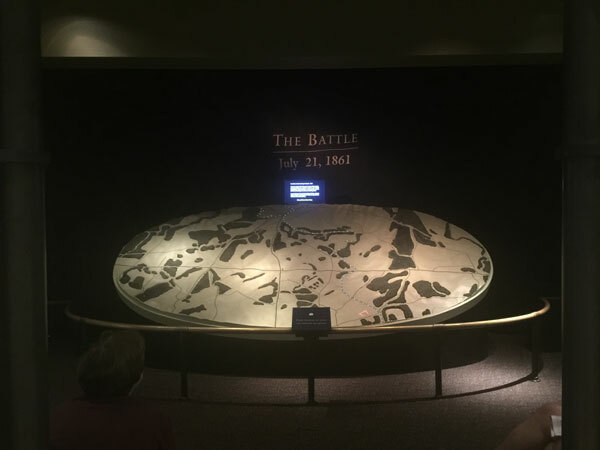 The museum also includes a 6 minute interactive map presentation that details out the formations and tactical aspects of the battles. We were also interested in learning about all the uniforms that were in the battle. Because the first battle of Manassas was early on in the war, there were over 200 different uniforms that soldiers wore. They didn’t know who to shoot at! Craziness! My son was super interested in this great painting in the foyer of the Visitor Center. After we watched the movie and spent some time in the museum, we headed outside and followed the 1-mile long path for the Henry Hill Walking Tour. I use the term “Path” loosely—the tour is marked by a strip of grass that is mowed shorter than the rest of the land. The cannons lead you to the Henry House, a rebuilt structure in the spot of the original Henry House which during the battle got obliterated. There was an interesting 3D video experience inside. I got a kick out of seeing my family like this! lol. 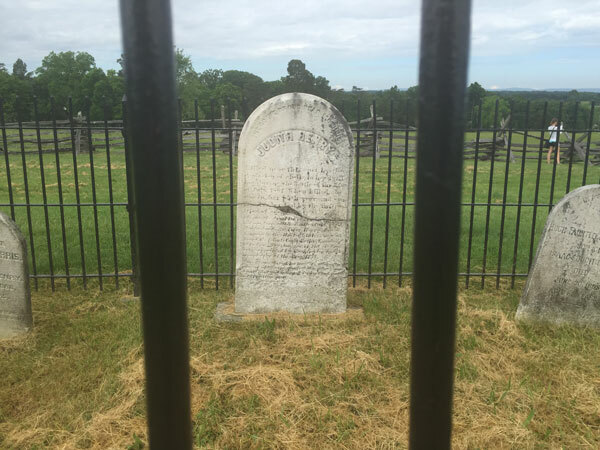 One of the sad stories about the battle here at Manassas is the death of Judith Henry who was in the house during the battle and got killed when the house was destroyed. This is her tombstone. This is the Henry Hill Monument which was built by Union soldiers in 1865. One of the coolest things about seeing historic sites like this is to see pictures from the time and realize that those people in the photo were literally standing at the site. The mile long walking tour has markers along the way describing the key points of the battle. For a more detailed description of the Henry Hill walking tour, check out this link. SPECIAL NOTE: Along the walking path there is a high risk of ticks. There is tall grass on both sides of the path and overhanging trees. 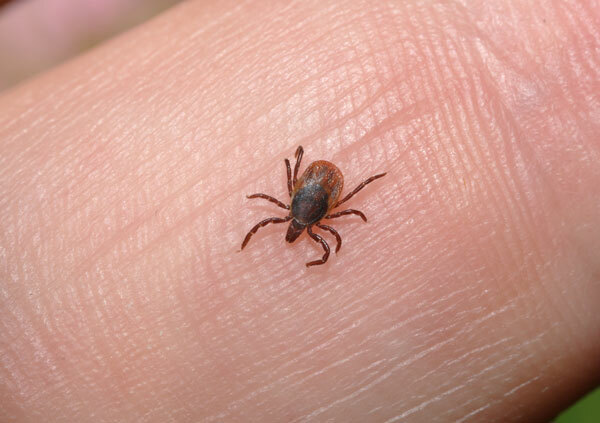 My wife found a tick on her during our walk. The National Park Service has a page that talks specifically about the ticks at Manassas National Battlefield Park. I absolutely love this picture of the kids. We were walking along the trail and the composition just seemed to appear in front of my eyes. They weren’t thrilled at me posing them but I am so glad I did. One of the final stops on the Henry Hill Walking tour is the statue of “Stonewall” Jackson. During the battle, Brig. Gen. Barnard E. Bee was rallying his men when he saw Gen. Thomas J. Jackson with fresh troops. “Look!” Bee shouted. “There stands Jackson like a stone wall!” The nickname stuck and “Stonewall” Jackson became a legend. 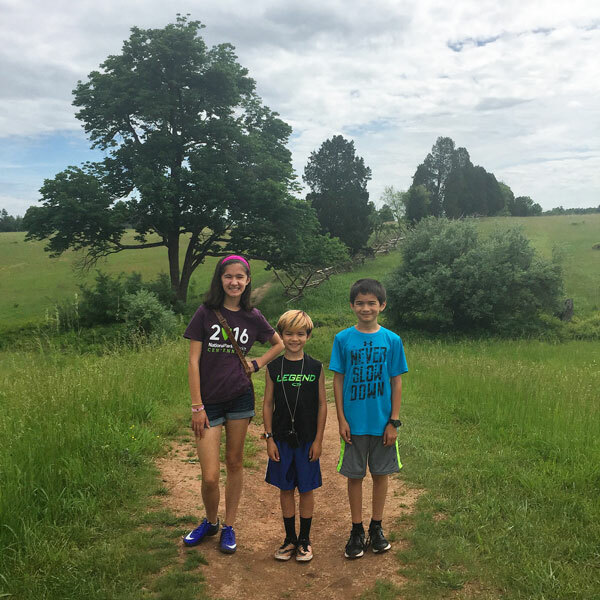 We had a great time at Manassas National Battlefield Park. 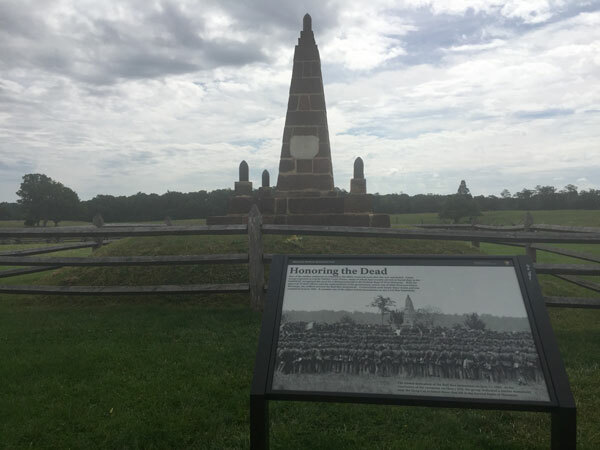 We spent about 3 hours there and while we didn’t have a chance to check out all of the significant sites at this park we did get an understanding of these 2 significant Civil War battles that occurred here. 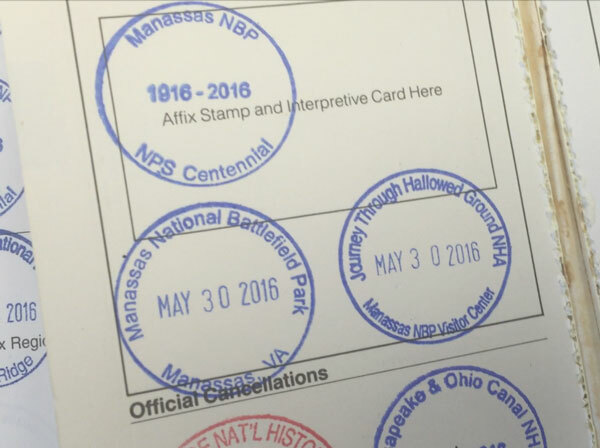 Our passport stamps at Manassas National Battlefield Park marked our 64th National Park unit visited as a family. We are making significant progress towards our goal of visiting 100 National Park units. To view our progress visit this link. 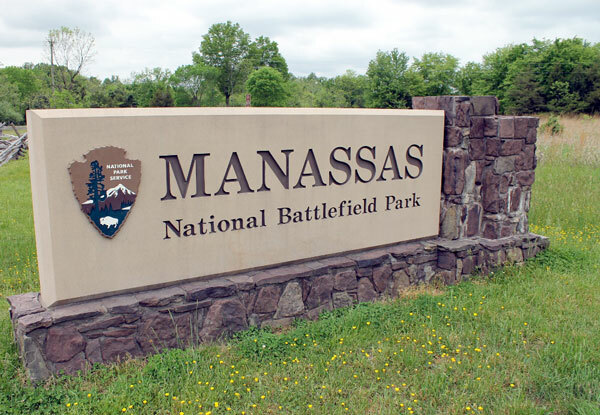 Have you been to Manassas National Battlefield Park? Share your experience in the comments! 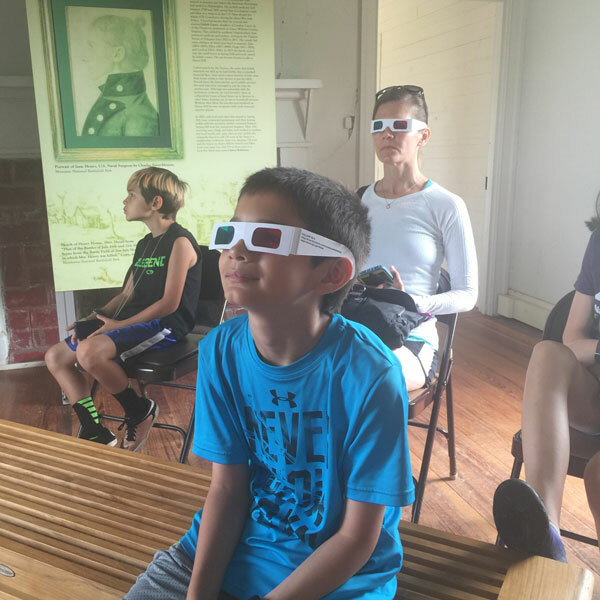 Learn all about Cowpens National Battlefield :: YoParks! Whoa, whoa, get out the way with that good intiamrfoon.